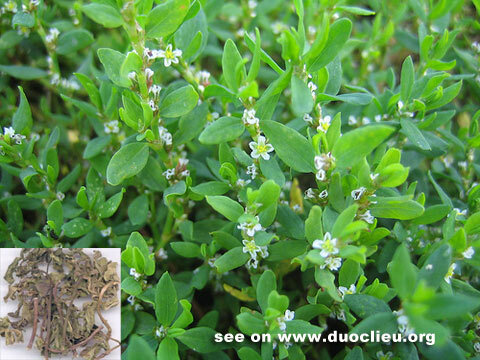 Common knotgrass (Bianxu)- Polygonum aviculare L.
Part Used & Method for Pharmaceutical Preparations: The aerial parts of the plant are gathered in summer and dried in the sun. Functions: 1. To promote water metabolism and regulate abnormal urination; 2. To expel parasites and stop itching. 1. Damp-heat in the urinary bladder manifested as scanty urine with blood, painful urination, urgency of micturition and frequent urination. Common knotgrass (Bianxu) is used with Pink (Qumai), Clematis stem (Mutong) and Talc (Huashi) in the formula Bazhen San. 2. Eczema and trichomonas vaginalis. The decoction of Common knotgrass (Bianxu) is used externally for washing.